The natural landscape off the coast of the Island of Itaparica in All Saints Bay in Brazil is characterized by a scenery that is in constant dialog between its diverse ecosystems: mangroves, rainforests, dunes. Its exuberant nature is highlighted by slender and tall palm trees which are of great significance to this region since they were introduced in Brazil in 1553 through the State of Bahia from where they subsequently spread across the country’s coastal northeast. 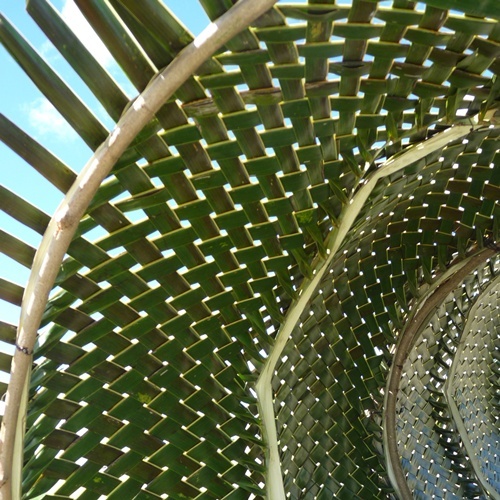 The work Lightweave consists of a dialogue with the natural landscape context of Bahia through a piece created with light that explores a local artisanal textile technique using the coconut palm leaf found in the island as raw material. It forms an interior space for personal reflection which creates a visual dialogue between the interior and exterior landscape that it delimits. From inside, the piece frames and suggests the landscape, creating a natural embroidery of light and shadow. The limits are defined by the vegetable skin that acts as a lattice filter fragmenting light beams and shadows. Throughout the day, its outward appearance varies through different shades and reflections and, at sunset, the light dilutes its apparent strength, allowing it to become a fabric that lights up from the inside and that blends into the landscape itself. in collaboration with Josemilton Reis da Silva, craftsman of the island of Itaparica.